Another benefit of all those new Boeing 777-300s that American has been adding to their fleet is that it frees up some 777-200s that can be redeployed on other routes, including a few domestic ones. American updated their schedules over the weekend and a few new 777-200 domestic flights were added. Even DFW is getting a little widebody love! 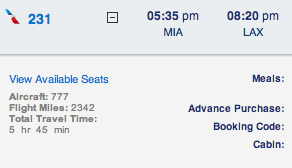 American is adding one more 777-200 flight each way between Miami and Los Angeles LAX. This is in addition to the two existing 777-200 flights they already offer every day from each airport to the other. Starting December 2, 2013 American will offer a total of three 777-200 flights from MIA to LAX and three from LAX to MIA. Two 772 flights from each city will offer 3 cabin service, and one will feature 2 cabin service with the business class seats being sold as economy and reserved for AAdvantage Elites and full fare passengers. Here’s a look at the new flights. American Airlines flight 231 from Los Angeles LAX to Miami MIA. The news that most excites me is that American is adding 777-200 service between my home airport, DFW, and LAX! Here are the new DFW/LAX flights. The new 772 flights begin November 20, 2013 and it’s being sold as a two cabin flight. I’m willing to predict now that AA2423 will become the toughest upgrade out of DFW! Speaking of domestic 777 flights….have you been following Mike Reed’s posts on his Getting Status blog about his recent trip on board the special, one time 777-300 flight that was offered from San Diego to New York JFK? Looks like he and a few other AA geeks had their own version of a mini oneworld MegaDo! Follow his posts at Experiencing the 777-300ER, SAN-JFK. That DFW-LAX timing is perfect for even connecting mileage running. I am sure the “double upgrade” will be hard, but still getting a bigger seat without the service is nice. 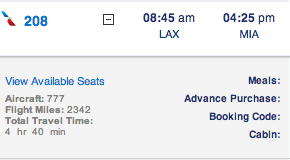 Can’t find the LAX-DFW 777 on 2/5/14. Any guidance? Thanks. Didn’t know you were DFW based. Maybe an obvious fact overlooked on my part. Let’s have coffee some time. These 777 additions are great. @ TTF – You’re right, a Business Class seats is great consolation if the upgrade doesn’t clear! @ Colleen – The DFW/LAX run disappears from the schedule after 1/7/2014. They update their widebody schedule fairly frequently and reposition their 767s and 777s based on demand. In December they’ll publish the domestic widebody schedule for Jan and Feb, so it’s possible that it will continue. I’m keeping my fingers crossed that it’s here to stay! @ DFW Steve -I’ll send you and email, coffee sounds like a good idea to me! Darn! Thanks. Is there a link where I can check it myself? You would have thought they would replace some of the 762s between LAX-JFK until the new A321T starts going into service next year…. Will DFW-LHR all get 777-300 at some point? Looks like a few of the flights still on the 200. @ Colleen – It used to be easy to find AA’s widebody schedule, it was posted on the AA Cargo website. They’ve updated AAcargo.com recently and now you have to use the search function to find the latest schedule. The search term I use is ‘domestic widebody’. Thanks for the comments! @ Mickey323 – We may not know until after the merger. I’m hoping so! aany pix of the 772 interior ? would be nice to compare it. Note that despite what AA’s res system might show in the initial load, the new MIA-LAX flight will be a 3-class service, not 2-class.